Santa Truck Rider Driving 3D - Christmas is around the corner and Snow is here to stay this holidays. It is so much fun to drive the Truck Simulator 3D in the snow world especially when it’s Santa Claus who is on his ride distributing gifts this Christmas festival season. 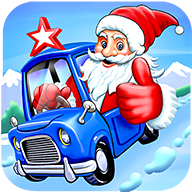 Help Santa drive the trucks completing challenging tasks and missions all through and make Santa’s ride more joyful and merriful.